The Toronto condo boom continues! East of Yonge there are numerous projects being built, from the Canary District to Riverside. Despite the seemingly endless construction in Toronto, the fact that more people are moving into the city and adding density to otherwise less populated areas is exciting. 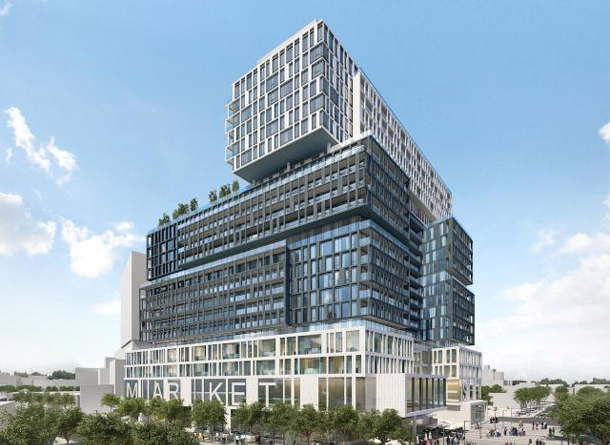 The projects are detailed in a terrific article from UrbanToronto. As an aside, if you look up some of the projects on Google Maps, take advantage of the history feature – you can see what used to be on these spots going back to 2007. For instance, it’s easy to forget about the gas station that sat at the corner of Wellesley and Sherbourne, but that space will soon be home to a condo tower with retail at the bottom which will bring a little more life to that corner. It looks like the Sherbourne corridor is going to see the most amount of change – from North St. Jamestown, which is about to get a four tower development that takes up the space bordered by Bloor, Sherbourne, Parliament and Howard Street to Front Street where the Pemberton Group has a proposal in for four towers. The good news is that many of these condos are being built on empty lots or replacing buildings that don’t hold any historical value. The bad news? So many of the condos are dull, grey and boxy. Certainly there are some exceptions like the proposed building at Parliament and Richmond (pictured above). Take a look at King + Condos at King and Sherbourne. The artists rendition doesn’t look too bad but see how it compares to the real thing.